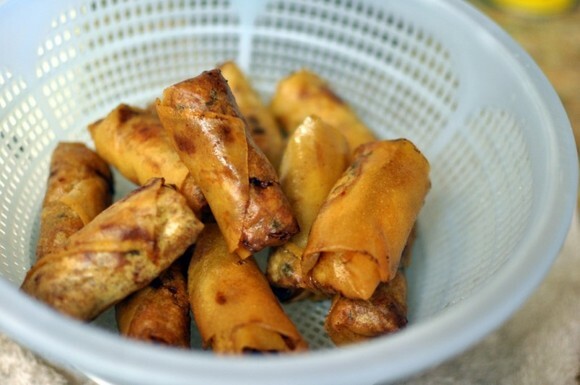 Whereas the bulk of Vietnamese dishes are more or less standardized, it seems that every Vietnamese family has their own unique recipe for chả giò (Vietnamese egg rolls). What’s interesting to note is that even within the same family, siblings can develop vastly different recipes. While living in Vietnam, I learned that my grandmother’s sister prepares her chả giò completely differently than our family in America. 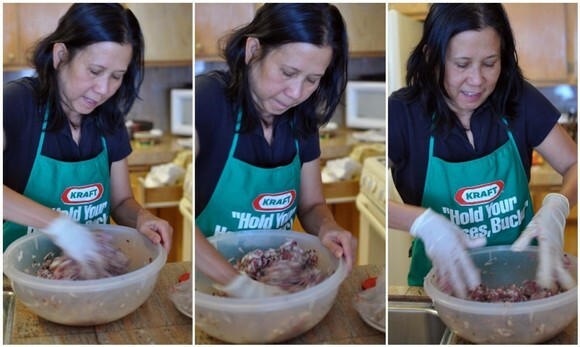 While my grandma employs a pork, shrimp, and mushroom filling, her sister uses grated taro root in hers. Some Vietnamese put carrots or even corn in their chả giò.Crab is also a popular but expensive filling. All chả giò found in Vietnam are made using rice paper wrappers, which results in a beautifully blistered exterior. Unable to locate suitable rice paper in America when this recipe was first developed, my family used generic Asian wrappers. Even with the availability of better rice paper these days, my family continues to use the generic wrappers for their superior crispness and browning properties. These chả giò taste wonderful eaten by themselves, sliced atop cool vermicelli noodles, or wrapped in herbs and greenery and dipped in fish sauce. This recipe yields sixty chả giò, which may seem excessive, but trust me, they’ll disappear very quickly. In two separate bowls, soak mushrooms and cellophane noodles in warm water for 30 minutes. Drain mushrooms and noodles thoroughly. Chop mushrooms finely and cut noodles into three-inch segments. 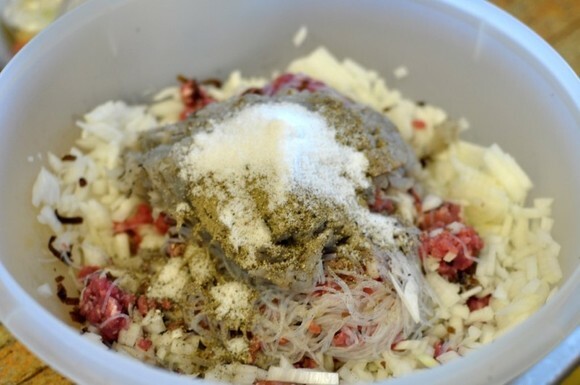 In a large bowl, combine pork, onion, noodles, mushrooms, MSG, salt, and pepper. One at a time, place shrimp on cutting board atop a sturdy surface (photo 1). 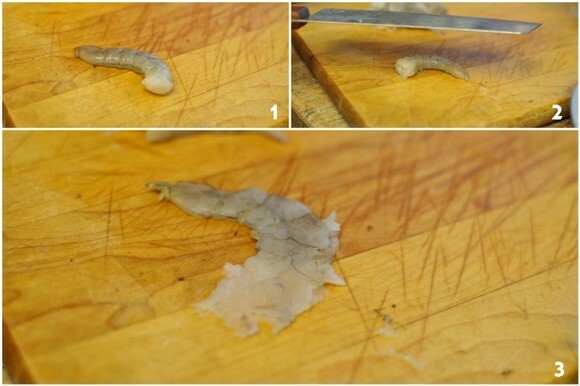 Using the side of a cleaver (photo 2), whack the shrimp two or three times until flattened (photo 3). The veins will naturally pop out. 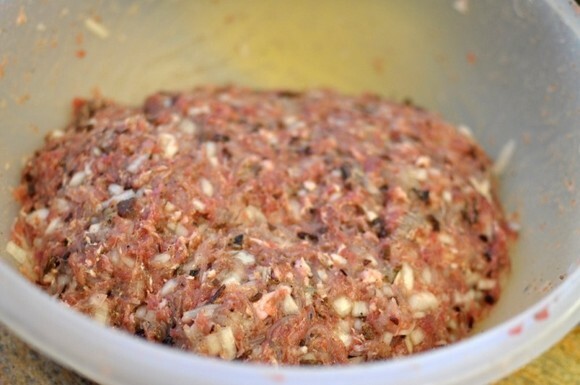 Once all of the shrimp have been flattened, run a knife through them to mince. Be careful not to over-chop the shrimp. Add the shrimp to the pork mixture. Using your hands (gloves optional), mix all of the ingredients together very well, blending the shrimp with the pork and spices. “Massage the meat,” my mother says. Once the filling has been properly massaged, set it aside to rest for at least fifteen minutes. The filling can be refrigerated overnight as well. Using a pair of kitchen scissors, cut the chả giò wrappers in half diagonally (photo 1). Next, separate each individual wrapper since they adhere to one another in the package. Set the wrappers aside. 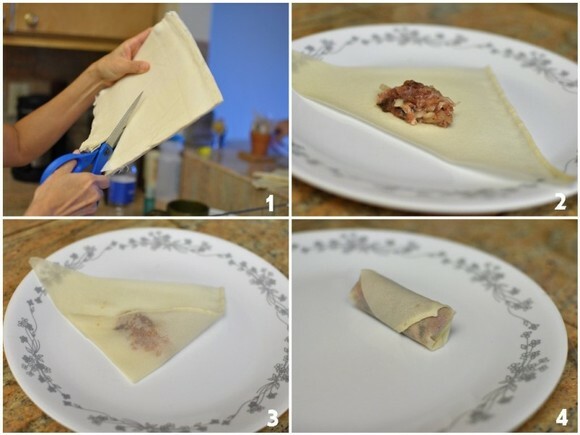 To assemble the chả giò, lay a wrapper on top of a plate or a flat surface. Place a heaping tablespoon of filling onto the wrapper (photo 2). Fold in the right side of the wrapper (photo 3) and then fold in the left side. 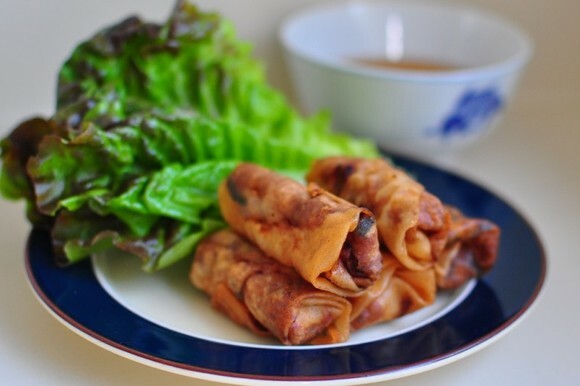 Gently roll the chả giò, tucking in the jagged ends as necessary. Repeat until all of the wrappers and filling have been used. Heat two cups of vegetable oil on medium heat in a wok or deep sauce pan. The oil should be at a depth of about 2 1/2 inches. 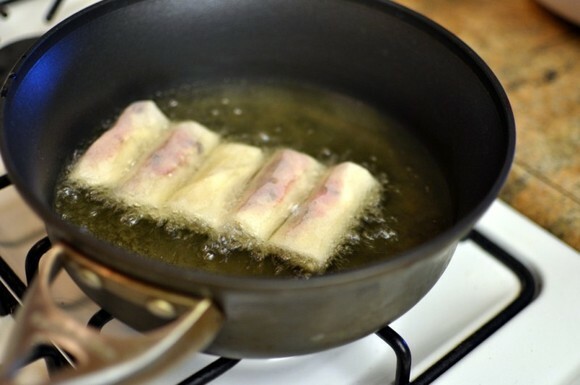 Gently lower each roll into the hot oil and fry until golden brown. Add additional oil as necessary. NOTE: Do not overheat the oil or else the wrapper will turn golden before the filling is cooked through. It is also important that the folded side of the chả giò be placed into the oil first to avoid unraveling. Once golden brown, remove the chả giò from the oil and drain in a colander or on absorbent paper towels. Let cool before serving. oooooh secret family recipe!!! love it. crunchy crispy! Fun! I’m gonna force my mom and aunt to have a cha gio -making party w/ me on one of my visits home. 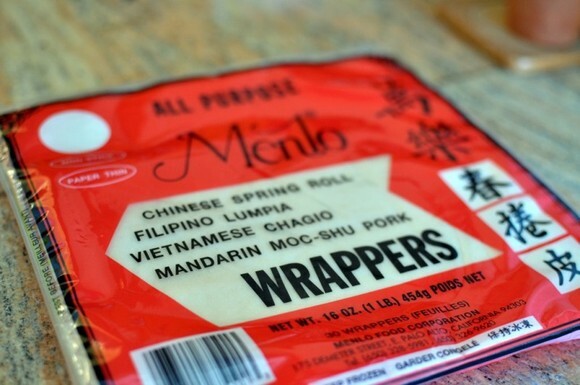 I grew up eating w/ the translucent rice paper on occasion (and it’s still my favorite! ), but definitely the other wrappers are used on a more daily basis. Thx for this. I think I’m gonna have to head to SGV for a cha gio fix! That looks so beautiful, and you make it appear so easy to make. the very first Vietnamese food word like 5 years ago. always lazy to deep fry in my house but…maybe this is it! remember I used to go to Golden Deli and try to impress the waiters by ordering it…ha, ha. My tummy is salivating reading this blog. I prefer the Vietnamese egg roll wrapper since cha gio tend to be very crispy and much more flavorful than the generic Filipino wrapper but you have to eat them fresh off the frying pan. I just can not find these VN wrapper anymore in the US, I am definitely going to bring back these from VN when I am going in a few weeks. these looks so good. i’m reeeaaeally craving spring rolls now. OMG this is funny. I was on FoodGawker and I favorite-d this, without looking at whose blog it was. I figured I would go back and look carefully at the recipe tomorrow. And then I visited my Google Reader and clicked on your latest post. Oh. Huh. I am soo excited, you have shown me the way to the smaller size rolls my husband loves, cutting the wrappers in half, genius! thanks so much! I’ve never attempted making these at home, dare I? I love the petite size, easier to roll up in lettuce leaves. I LOVE Vietnamese egg rolls! I’m coming over. drool! Those look terrific. I’m definitely bookmarking for the next time Logan wants to take on a project! Do the unfried cha gio keep well – frozen, maybe? yummy. i love all manner of rolls esp. w/ shrimp and msg. Rachel – My mom prefers not to freeze the meat or the egg rolls because she says they don’t taste as good defrosted. mmm… i haven’t had these since forever now. i will attempt to cook so i can have some. my kids can’t wait till we do it. i usually make regular lumpia, but nothing beats the vietnamese lumpia with the noodles, lettuce, and fish sauce. thanks! Yay! My mom was just asking for a recipe for these! I’m excited too because there’s no frakking Vietnamese food anywhere west of Pasadena (Excluding K Town Pho places) so I’m just going to have to make my own. Thanks Cathy! There is some great Vietnamese west of Pasadena! Two almost side by side on Reseda Blvd just north of Sherman Way; Pho 999 (my personal fav) and Pho So 1 which is also quite good. Pho 999 also has a location on Sepulveda Blvd in Van Nuys next to the 99 Ranch Market and one on Sherman Way near Coldwater.. but the Reseda location seems to be a little better, IMHO..
Made this recipe last night. it was lovely, and much easier then i thought.